CLOWNS, UNICORNS AND SHARKS, OH MY! — Sam (Jared Padalecki) is forced to confront a childhood fear when a case takes him and Dean (Jensen Ackles) to Kansas to investigate Plucky Pennywhistle’s Magical Menagerie, a local pizza chain that hosts children’s birthday parties. Sam and Dean discover that the victims’ children had recently been to the restaurant and drawn a picture of their worst fear, which then came to life to kill their parent. While Dean confronts the man behind the magic, Sam is left to deal with some very angry clowns. Mike Rohl directed the episode written by Andrew Dabb & Daniel Loflin. 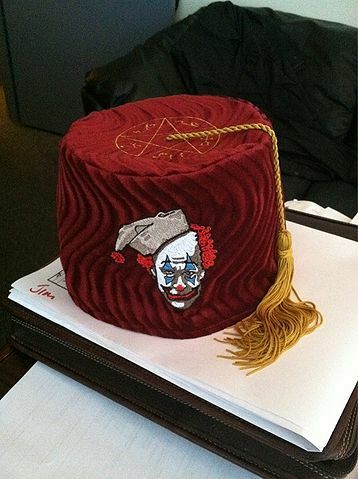 Episode 7.14 will be called "Plucky Pennywhistle's Magical Menagerie" and will feature a character called Howard. He works at Plucky Pennywhistle's Magical Menagerie which is Chuck-e-cheese style place. Ausiello: During an upcoming visit to Plucky Pennywhistle’s Magical Menagerie — think Chuck-E-Cheese minus Chuck and possibly also the cheese — the Winchesters will run afoul of an employee who comes off like Peter Pan… but underneath is probably more like Captain Hook. Das wird die zweite Ep sein die ich alleine gucken muss. Meine Tochter hat nämlich auch eine Höllenangst vor Clowns. Sie hat sich damals schon geweigert 'Everybody loves a Clown' mit an zu schauen. Awww Dean, all work, no play. Klingt aber trotzdem sehr interessant. Und die läuft nächste Woche? Cool. Mal keine Pause dazwischen. Noch besser hat mir der Spruch gefallen, den er nachher abgelassen hat mit no hot chicks etc. Mal schauen wie lange er das durchhält. O.M.G. Man sieht Sam seine Angst vor diesen bunten Scheusalen richtig an. Clowns...wer braucht die schon?